With this iExpression you can move a 3D layer in and out of screen using a uniformly accelerated movement in any direction. At first sight the motion might seem similar to using 'easy ease' keyframes, but due to the uniform deceleration when moving in and uniform acceleration when moving out, the movement is slightly different and more natural. The direction is given via two angles (like in a spherical coordinate system). determines how fast the object decelerates when moving in and accelerates when moving out. is the angle (i.e. the direction) from which the object is moving into the frame. The first component denotes the horizontal angle, i.e. the angle on the ground plane (like shown on a compass). It the camera has its default orientation, 0 degree means moving in from z direction, -90 degree from left and 90 degree from right. 180 degree means moving in from the viewers point of view. The second component denotes the vertical angle. 0 degree means a purely horizontal movement, 45 degree moving in diagonally from above and -45 degree from diagonally below. 90 degree means moving in vertically from the top and -90 degree from the bottom. is the angle (i.e. the direction) in which the object is moving out of the frame. The first component denotes the horizontal angle, i.e. the angle on the ground plane (like shown on a compass). It the camera has its default orientation, 0 degree means moving out in z direction, -90 degree to the left and 90 degree to the right. 180 degree means moving towards the viewers point of view. The second component denotes the vertical angle. 0 degree means a purely horizontal movement, 45 degree moving out diagonally upwards and -45 degree diagonally downwards. 90 degree means moving straight up and -90 degree straight down. controls whether a movement into the frame should be enabled and if so at which point in time this movement should be finished (at the first keyframe, an a manually chosen keyframe, at a manually chosen frame, or no movement into the frame at all). Move In (Key) Frame No. is the frame or the keyframe (depending on the choice of 'Move In At' option) at which the movement into the frame should be finished. If 'Move In At' has any other value than 'keyframe no.' or 'frame no.' this value is ignored. controls whether a movement out of the frame should be enabled and if so at which point in time this movement should start (at the first keyframe, an a manually chosen keyframe, at a manually chosen frame, or no movement out of the frame at all). Move Out (Key) Frame No. 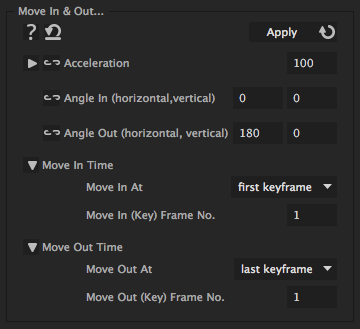 is the frame or the keyframe (depending on the choice of 'Move Out At' option) at which the movement out of the frame starts. If 'Move Out At' has any other value than 'keyframe no.' or 'frame no.' this value is ignored.